This article is a quick introduction to how to use the Metal, MetalKit, and Model I/O frameworks in Swift. If you know your way around UIKit or Cocoa development, you should be able to follow along for the most part. Some things like shaders and matrices will be foreign to you, but you can learn them as you go about exploring Metal on your own. The purpose here is to give you a template to build on. If you want to follow along without copy-pasting the code yourself, you can clone this GitHub repository and follow the instructions there. First things first. Use Xcode to create a new project from the iOS Single View App template. Add import MetalKit at the top of the ViewController.swift file. We could use the Game template instead and have some of the boilerplate written for us, but writing it out long-hand will give us more of an appreciation for the moving parts. The Game template also includes a lot of moving parts that get in the way of understanding the basics. MTKView is a class provided by the MetalKit framework that makes working with Metal much easier. It handles things like creating an instance of the special CALayer subclass that talks to UIKit for you and driving the animation loop. You could make this an @IBOutlet if you want to add your MTKView with Interface Builder instead of in code. We will also use the Metal device to create resources ourselves, as well as the objects that dispatch commands to the GPU 1. Finally, we need to tell the view the format of the color texture we will be drawing to. We will choose bgra8Unorm, which is a format that uses one byte per color channel (red, green, blue, and alpha (transparency)), laid out in blue, green, red, alpha order. The Unorm portion of the name signifies that the components are stored as unsigned 8-bit values, so that the values 0-255 map to 0-100% intensity (or 0-100% opacity, in the case of the alpha channel). If you build and run the project on a device at this point, you’ll probably just see a blank white screen. That’s expected—we still have a while to go before we’re drawing 3D content. Create a new file called Renderer.swift. Also add import MetalKit at the top of this file, since our renderer will need to use classes from Metal and MetalKit. Create a new class named Renderer that conforms to the MTKViewDelegate protocol. This protocol declares the methods that the MTKView will call to perform rendering, and to notify you when its size changes. Here is the basic implementation that we will be expanding on in the coming sections. The mtkView(_:drawableSizeWillChange:) method is called when the view changes size. This lets us update any resources or properties that might be resolution-dependent, most particularly our projection matrix. More on that later. For now we’re just building the scaffolding. The draw(in:) method is similar to UIView‘s draw(_:) method, in that it redraws the contents of the view. The difference here is that we’ll be using Metal to render the view’s contents instead of Core Graphics. Now that we’ve set up communication between the view and the renderer, we’ll be doing most of our work in the Renderer class. Model I/O is a framework that makes it extremely easy to load 3D data. Model I/O is also built to make it easy to render this data with Metal. Find an OBJ model file that you want to render. 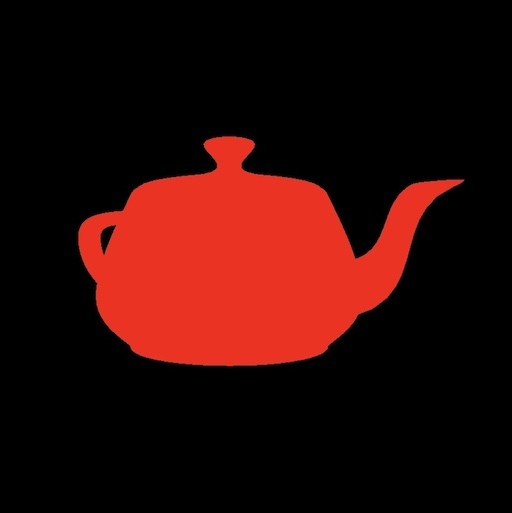 I chose the classic Utah teapot (available here). You may need to open your file in a modeling program and ensure it fits in a unit cube to use the code in this article unmodified. If that doesn’t mean anything to you, just use the teapot and forge ahead anyway. Add the OBJ file to your Xcode project. let modelURL = Bundle.main.url(forResource: "teapot", withExtension: "obj")! An asset can contain many things, including lights, cameras, and meshes. For now, we just care about the meshes. This completes our implementation of loadResources() for now. In Model I/O parlance, a mesh is a collection of vertex buffers and submeshes. A submesh contains an index buffer and additional data about how many indices should be rendered when it is drawn, and the type of primitive (triangles, lines, points, etc.) it should be drawn as. The newMeshes method returns both the “original” MDLMesh objects (which we don’t care about) and the converted MTKMesh objects as a tuple. Since we only want to keep the MTKMeshes, we destructure the tuple and store only the second part in our meshes property. Believe it or not, that’s all it takes to prepare the data from our model file to be rendered with Metal. However, we’re really just getting started. Now we need to talk about shaders. A shader is a small program that runs on the GPU, and in our sample project, we’ll need to deal with two flavors of shaders: vertex and fragment shaders. A vertex shader runs once per vertex, each time we draw our geometry. The vertex shader’s job is to transform vertex data from the coordinate space in which it was modeled into the coordinate space expected by the rest of the Metal rendering pipeline, which is called clip space. Clip space is a coordinate space 2 that describes which portion of the scene is visible to our virtual camera. Specifically, coordinates that are between -1 and 1 in the x and y axes and between 0 and 1 in the z axis in clip space are within the camera’s field of view. Any triangles outside of this box will not appear on the screen, and any triangle that intersects this box will be modified so that only its visible portion continues to the later stages of the pipeline. The process of removing invisible triangles entirely is called culling, and the process of preserving only the visible portion of partially-visible triangles is called clipping, hence the name of clip space. How we actually get from so-called model space to clip space is beyond the scope of this guide, but briefly, we do it by multiplying the positions of our vertices by a sequence of specially-computed matrices that result in our desired transformation 3. We’ll see some examples of transformation matrices below, including the projection matrix, which represents the last step that takes our vertices into clip space. Create a new Metal File in your project called Shaders.metal. This file will hold all of the shader functions we write. This file is not in Swift, but a variant of the C++ programming language called the Metal Shading Language. These lines import the Metal Standard Library into the global namespace. The Metal Standard Library contains many types and functions for doing vertex and matrix math, which is most of what we’ll be doing in our shaders. The VertexIn struct maps exactly to the vertex descriptor we created when loading our model file with Model I/O: two three-component floating-point vectors (float3), representing position and the surface normal, and a two-component floating-point vector (float2) holding the texture coordinates. The Uniforms struct contains a pair of matrices. The model-view matrix is a matrix that transforms the vertices and normals of the model into camera coordinates. (Note: we’re ignoring the differences between how positions and normals transform, which would turn out badly if we were performing certain transformations like non-uniform scaling, but we’ll ignore that for now for simplicity’s sake). The first parameter is the incoming vertex data, an instance of the VertexIn struct described above. This parameter is attributed with [[stage_in]] to signify that it is built for us by loading data according to the vertex descriptor. The second parameter is a reference to an instance of the Uniforms struct, which will hold the matrices we use to transform our vertices. Inside the function, we first instantiate the output vertex structure. Then, we multiply the vertex position by the model-view matrix and the projection matrix (by convention, we read matrix multiplication from right to left). This moves the vertex position from model space to clip space, which is needed by the next stages of the pipeline. Then, we multiply the object normal by just the model-view matrix, which leaves it in eye space. We do this because we will want to calculate things like lighting and reflections in eye space instead of model space. For the same reason, we also compute the eye space position of the vertex. Finally, we pass through the texture coordinates and return the transformed vertex structure. After each vertex is returned from the vertex function, the GPU determines which pixels on the screen could possibly be contained by its corresponding triangle, then interpolates the values we returned from the vertex function to create fragments. This job is specifically done by a portion of the pipeline called the rasterizer, and it’s not something we control directly. A fragment is a potential contributor to the color of a pixel. Some fragments don’t wind up affecting their corresponding pixel (because they’re hidden behind another surface or because we choose to discard them intentionally), but we still need to compute a color for each fragment. This is the job of the fragment shader. The fragment shader (or more precisely, fragment function) is called once per fragment to determine what its color should be. It can make this determination by performing lighting calculations, sampling colors from a texture, or any other computation. For the time being, we’ll just return a solid red color for every fragment. We’ll write a more sophisticated fragment shader shortly. Among other things, we will need references to a pair of objects that represent the shaders we just wrote. These are instances of the MTLFunction type, and we get functions by first creating a library. A library is simply a collection of named functions, and the default library contains all of the functions that are compiled into our app bundle, like the ones we just wrote. If we fail to get the default library, we won’t be doing any drawing, so we abort the program. Finally, we’re getting close to actually issuing drawing commands, but in order to actually issue commands to the GPU, we need to create the object that manages access to the GPU: the command queue. The command queue stores a sequence of command buffers, which we will create and write GPU commands into. Commands consist of things like state-setting operations (which describe how things should be drawn and what resources they should be drawn with) as well as draw calls, which tell the GPU to actually draw geometry, causing our vertex and fragment functions to be called and producing the pixels that wind up on the screen. Encoding is the process of translating from API calls into the actual commands understood by the GPU. The render pass descriptor tells Metal which textures we will actually be drawing into. Recall that we previously configured the render pipeline state with the pixel format of one of these textures by setting the pixelFormat property on its first color attachment. The render pass descriptor has corresponding color attachments that represent the actual textures (images) we will be drawing into. Fortunately, the MTKView actually manages these textures for us, so we simply ask for its preconfigured render pass descriptor for the current frame. A drawable is an object that holds a color texture and knows how to present it on the screen. Behind the scenes, the MTKView has already set the current drawable’s texture as the texture of its first color attachment. This means that whatever color is returned by the fragment function will be written into the corresponding pixel of this texture. Once we’re done drawing, we will issue a command to present this texture on the screen, which will make our 3D scene visible to the user. let commandEncoder = commandBuffer.makeRenderCommandEncoder(descriptor: renderPassDescriptor)! To tell our vertex function where to get data from, we need to tell it which buffers contain the data. We will accomplish this in two separate ways, depending on the type of data. First, we will set up the buffer that contains our vertex data with the setVertexBuffer(_:offset:index:) method. The offset parameter indicates where in the buffer the data starts, while the at parameter specifies the buffer index. The buffer index corresponds to the bufferIndex property of the attributes specified in our vertex descriptor; this is what creates the linkage between how the data is laid out in the buffer and how it is laid out in the struct taken as a parameter by our vertex function. Second, we will set up the buffer that contains the uniform data. Because this data is so small, we would like to avoid creating a dedicated buffer for it. Fortunately, the render command encoder has a method called setVertexBytes(_:length:index:) that enables exactly this. This method takes a pointer to some data that will be written into a buffer that is managed internally by Metal. In this case, the buffer index specified by the last parameter matches the index of the [[buffer()]] attribute in the parameter list of the vertex function. In this sample app, we dedicate buffer index 1 to our uniform buffer. These functions allow us to express the basic operations of rotation, scale, translation, and projection. Jumping back into the draw(in:) method, we can put these matrix utilities to use in building the matrices we want to consume in our vertex function. This matrix scales up the model by a factor of two in all dimensions and rotates it slightly clockwise about the positive Y axis. This matrix causes all vertices to be moved -2 units along the Z axis, which points straight out of the screen. This has the effect of positioning our camera at +2 units along this axis. The view matrix is basically the inverse of the transformation that describes how the camera is positioned and oriented in virtual space. One of the projection matrix parameters is the screen aspect ratio. Since clip space has a square aspect ratio along its x and y axes, but our screen is a rectangle, we need to apply a non-uniform scale to counteract this mismatch. The nearZ and farZ parameters determine which distances from the eye correspond to the near and far planes of the clipping space volume. Thus, anything nearer to the camera than 0.1 units or further than 100 units will be clipped and not visible. The uniform values will now be available inside the vertex function as the parameter attributed with [[buffer(1)]]. We’re now (finally!) ready to issue the sequence of draw calls that will actually render the model to the screen. The drawIndexedPrimitives method tells Metal to render a sequence of primitives, or shapes. The type parameter specifies what type of primitive to draw (often, this will be .triangles; here, we just pass the submesh’s primitiveType, derived from the model file we loaded earlier). The subsequent parameters specify how many indices will be used, what type they are (unsigned 16-bit or unsigned 32-bit integer), and the buffer in which the indices are located. Metal will iterate over this index buffer, creating one triangle for each set of three indices. The vertex located at each of these indices will be read from the previously-set mesh vertex buffer and passed into the vertex function. Subsequently, rasterization and fragment shading will be performed for each pixel inside the triangle’s boundary, and the resulting colors will be written into the color texture. Ending encoding signifies that we won’t be doing any more drawing with this render command encoder. If we wanted to draw additional objects, we would need to do that before calling endEncoding. Once we’re done encoding commands into the command buffer, we commit it, so its queue knows that it should ship the commands over to the GPU. A millisecond or two later, drawing will be done, and our image will be ready for display. You could speed up or slow down the animation by multiplying time by an additional factor. To view the code for this step, use git checkout step1_3. I’ve tried to keep the number of concepts in this article to a bare minimum, but we’ve covered an astonishing amount of ground, from a blank screen to a spinning 3D object! Despite the density of the material, all of this only took about 200 lines of code, and we’ve laid a great foundation for future work. In subsequent articles, we’ll talk about basic lighting, materials and textures, managing a scene graph with multiple objects, and basics of interaction with 3D scenes. Stay tuned! The Metal by Example Book is Now Available! I managed to rewrite part of the project done by Warren to run on Macs. If Warren allows me and if someone is interested in that, I can share it in GitHub. By all means, share! I’ll happily link to your fork/repo from the post. I posted a link, but apparently it was removed. I don’t know if it was by you or by an overeager Akismet anti-spam action. If it was the latter, please send me an email and I will send the link to you directly. Keep up the good work, old friend! Is Metal using Right hand system like opengl? I thought it used left hand system. Metal doesn’t have an opinion about the handedness of coordinate systems until you get into clip space. Metal’s clip space is left-handed in the sense that +X is right, +Y is up, and +Z is “into” the screen. However, screen coordinates are right-handed, since the viewport transform flips the Y axis. All of this agrees with Direct3D’s conventions (including the fact that clip space is a hemicube rather than a cube, as in OpenGL). I prefer right-handed world and view systems with Y up, but that’s an arbitrary choice. The projection matrix is responsible for making eye space “agree” with clip space. It took me sometime to understand. I am using left-handed system for projection matrix. I am thinking if it is possible to use right-handed system for projection matrix and don’t invert z-axis on the shader. I suppose if you use a model matrix with Z inverted, and also reverse the winding order of the mesh, it should be possible to use one projection matrix to handle both types of models (those originating in a left-handed space, and those originating from a right-handed space). You have an error in your perspective projection matrix. You’re absolutely right. Sorry for the error. I’ve fixed this in the article and patched it on GIthub, but it’s something for readers to be aware of if they’re using git to work through the checkpoints in the article.